Today only, Kohl's is offering select Black Friday prices now. One of my favorite deals is the Disney Toddler Dollie & Me outfits for only $12.80 (Reg. $32). Valid 11/3/16. Plus, cardholders can use code: TAKE15 for an additional 15% off making these only $10.88. Kohl's just released the anticipated 2016 Black Friday Ad. Stores will be opening Thursday, November 24th at 6pm. Black Friday deals will be live online starting November 21st. You will also be able to earn $15 Kohl's cash for every $50 spent. See the full ad scan here. 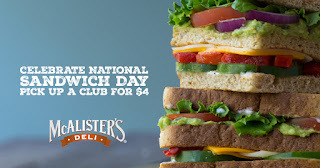 McAlister's Deli National Sandwich Day ~ $4 Clubs All Day! McAlister's has partnered with four notable food artists from across the world, Samantha Lee, Selena Kohng, Jill Mills and Harley Langberg, challenging them to create one-of-a-kind masterpieces using only the ingredients in the McAlister's Club sandwiches of their choice, as their inspiration and materials. Each artist will be sharing their original creations throughout the week across their Facebook® and Instagram® channels. Fans of McAlister's Deli are encouraged to follow the National Sandwich Day fun on McAlister's social media channels, where they will be hosting a sweepstakes giving away free clubs for a year! 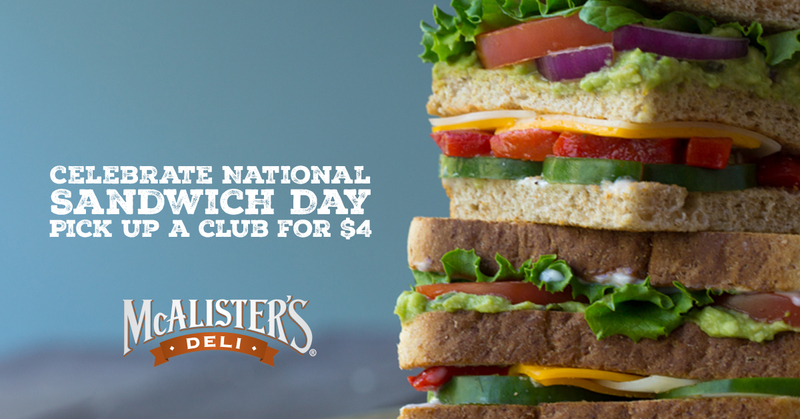 @McAlistersDeli and #NationalSandwichDay! Target Cartwheel 50% off Toy Deal 11/3! This gets better with the 20% off toy coupon. Pair this Cartwheel offer with the 20% off Toys, Sporting Goods or Kids Arts & Crafts Purchase Target Store Coupon found in the new Toy Catalog or text KIDSGIFTS to 827438 for the mobile coupon (expires 11/5) – excludes LEGO & board games.